Up until a few years back, as a traditional textile, ikat fabric was mostly used for a sari or a dupatta. But not anymore! The stunning fabric has gained a great fan following in recent years and it’s now being used as an interior design element too. 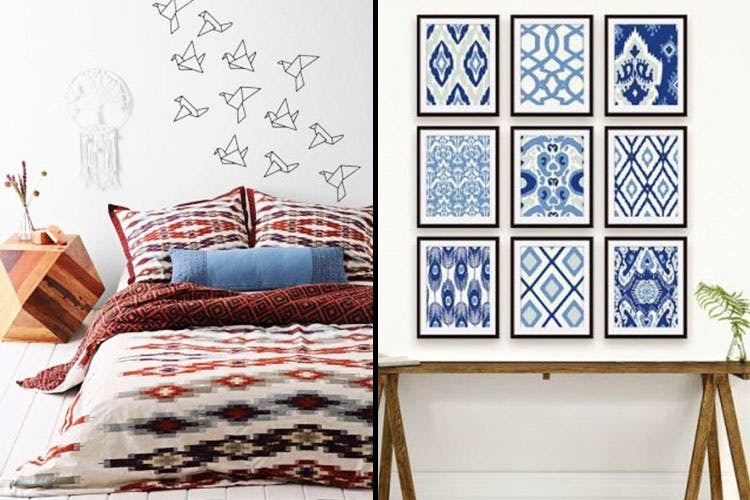 If you love ikat like we do, we’re telling you everything about adding it to your house to make it look stunning, while also adding an ethnic vibe. Catch hold of your local carpenter and get him to make you a vibrant ikat lampshade in cotton or silk to match your decor. If you want the lamp to be funky, colour the body of the lamp in a totally different shade. For example, if your ikat shade is a bright pink, paint the body a dark green. Where to buy in Delhi: Pick the ikat of your choice from Lajpat Nagar export market near Rampul, Lepakshi emporium (CP) or on Fabriclore. Then, head to Lok Nayak Bhavan or Panchkuian Road for fabrication of your lampshade. You can also accentuate it with lace and tassels. An upholstered ikat headboard is an apt addition to brighten the ambience of the room and make it look aesthetically pleasing. As shown in the picture, you can match the ikat print of the headboard with the wall or vice versa. It’s best advised to engage a trustworthy upholster to carry out the job. Ditch the regular coaster and make yourself a set of trivets. It’s fairly simple. Pick an ikat fabric of your choice and get it framed from a local frame shop. Voila! Your trivet will be ready to be flaunted on a side table, a cabinet or even your beautiful console. Where to buy Ikat fabric in Delhi: KC Creations (Lajpat Nagar), Fabrics2buy, Nehru Place, The Fabric People, (Shahpur Jat), Central Cottage Industries Emporium (CP), Shankar Market and online on Jaypore. Once you have the fabric of your choice in hand, go to a local painting-wallah to get the ikat framed in an appropriate size or shape. Even though the robe in the picture is from Uzbekistan, you can make it on your own. Purchase some lovely ikat cloth from the market and a good printed fabric to go with it. Head to your local tailor and have it switched. To lend it a royal touch, get it framed in gold or silver. Hang it in the middle of your drawing room surrounded by miniature art in colourful small frames – like a unique gallery wall. Where to get an ikat robe stitched: Shankar Market has some really talented tailors to do the job. Buy six different ikat prints in the same colour and get them framed. Place them all together on a wall or group them in twos or threes – another way to get a unique gallery wall! #UrbanclapEasyHack: If you don’t want to scout for fabrics, you could just grab these ikat pattern freebies, print them on paper and frame them. And if you’d rather go for a single pretty ikat pattern, print a freebie like this one and you can even skip the gallery wall process. Enhance the decor of your bathroom with colourful ikat wallpaper. On a cooler note, you can even use contrasting ikat wallpapers for different walls of the bathroom. Throw in hip bathroom accessories and fresh flowers and your favourite place in the whole house will be ready. Where to buy in Delhi: Cottons ‘n’ Satins (Meherchand Market) and Good Earth (Khan Market). Don’t they say it takes two to tango? Well, team an ikat bedcover with matching or contrasting pillow covers with origami birds and a wooden table. They will make a stellar combination! Otherwise, team a monochrome bedcover with ikat pillow covers in a totally different or crazy colour. It will be magic. Where to buy in Delhi: Lepakshi Emporium (CP), Sakshi Export Collection (Shop no 140, Sarojini Nagar), Translate Handwoven Ikat, Hauz Khas Village and Sarita Handa. As a go-to global fabric, an ikat sofa can enliven the most traditional or contemporary room. Dress up your Bridgewater or Lawson-style sofa in ikat silk with plain matching cushions. Or transform your room into something more majestic by upholstering your Chaise lounge with a thick ikat in deep hues. Buy a set of striking ikat crockery for your dining table. You can opt for dining plates, platters (as shown in the picture) or even soup bowls. Spread a plain-coloured table cover and lay out your ikat finery to create a superb style statement. Where to buy in Delhi & Online: Dilli Haat, INA Market, Amazon India and Asian Accents. We hope you’re sold on ikat. It’s such a versatile centuries-old fabric that you can be really creative with it. This recommendation was first posted on UrbanClap Homes.